Treatment of breast cancer, gestational choriocarcinoma, and in patients with chorioadenoma destruens and hydatidiform mole. Palliation of acute and subacute lymphocytic leukaemia. Greatest effect has been observed in palliation of acute lymphoblastic (stem cell) leukaemias. In combination with corticosteroids, methotrexate may be used for induction of remission. The drug is now most commonly used for the maintenance of induced remissions. Methoblastin is also effective in the treatment of the advanced stages (III and IV, Peters Staging System) of lymphosarcoma, particularly in children and in advanced cases of mycosis fungoides. PSORIASIS CHEMOTHERAPY: (See WARNINGS box and Precautions). Because of the high risk attending to its use, Methoblastin is only indicated in the symptomatic control of severe, recalcitrant, disabling psoriasis which is not adequately responsive to other forms of therapy, but only when the diagnosis has been established, as by biopsy and/or after dermatologic consultations. RHEUMATOID ARTHRITIS CHEMOTHERAPY: (See WARNINGS box and Precautions). Management of severe, recalcitrant, active rheumatoid arthritis in adults not responding to, or intolerant of, an adequate trial of NSAIDs and one or more disease modifying drugs. Aspirin, NSAIDs and/or low dose steroids may be continued, although the possibility of increased toxicity with concomitant use of NSAIDs including salicylate has not been fully explored. (See Precautions, Interactions with other drugs). Steroids may be reduced gradually in patients who respond to methotrexate. Combined use of methotrexate with gold, penicillamine, hydroxychloroquine, sulfasalazine or cytotoxic agents has not been studied and may increase the incidence of adverse effects. Rest and physiotherapy as indicated should be continued. 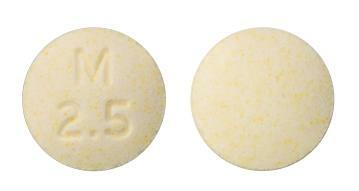 Yellow, capsule shaped, uncoated tablets engraved M 10 and scored on one side and plain on the other. ANTINEOPLASTIC CHEMOTHERAPY: Treatment of breast cancer, gestational choriocarcinoma, and in patients with chorioadenoma destruens and hydatidiform mole. Palliation of acute and subacute lymphocytic leukaemia. Greatest effect has been observed in palliation of acute lymphoblastic (stem cell) leukaemias. In combination with corticosteroids, methotrexate may be used for induction of remission. The drug is now most commonly used for the maintenance of induced remissions. Methoblastin is also effective in the treatment of the advanced stages (III and IV, Peters Staging System) of lymphosarcoma, particularly in children and in advanced cases of mycosis fungoides. PSORIASIS CHEMOTHERAPY: (See WARNINGS box and Precautions). Because of the high risk attending to its use, Methoblastin is only indicated in the symptomatic control of severe, recalcitrant, disabling psoriasis which is not adequately responsive to other forms of therapy, but only when the diagnosis has been established, as by biopsy and/or after dermatologic consultations. RHEUMATOID ARTHRITIS CHEMOTHERAPY: (See WARNINGS box and Precautions). Management of severe, recalcitrant, active rheumatoid arthritis in adults not responding to, or intolerant of, an adequate trial of NSAIDs and one or more disease modifying drugs. Aspirin, NSAIDs and/or low dose steroids may be continued, although the possibility of increased toxicity with concomitant use of NSAIDs including salicylate has not been fully explored. (See Precautions, Interactions with other drugs). Steroids may be reduced gradually in patients who respond to methotrexate. Combined use of methotrexate with gold, penicillamine, hydroxychloroquine, sulfasalazine or cytotoxic agents has not been studied and may increase the incidence of adverse effects. Rest and physiotherapy as indicated should be continued. Yellow, round, biconvex, uncoated tablets engraved M 2.5 on one side and blank on the other. Idiopathic retroperitoneal fibrosis is a rare inflammatory condition that can lead to abdominal pain and kidney failure.